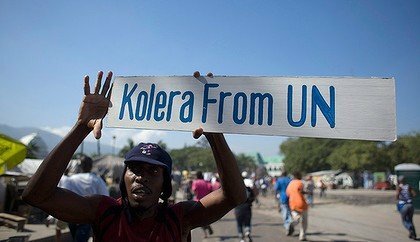 The United Nations has formally rejected compensation claims by victims of a cholera outbreak in Haiti that has killed almost 8,000 people. UN Secretary General Ban Ki-moon called Haitian President Michel Martelly to inform him of the decision. The UN says it is immune from such claims under the UN’s Convention on the Privileges and Immunities of the UN. Evidence suggests cholera was introduced to Haiti through a UN base’s leaking sewage pipes. The UN has never acknowledged responsibility for the outbreak – which has infected more than 600,000 people – saying it is impossible to pinpoint the exact source of the disease, despite the mounting evidence the epidemic was caused by poor sanitation at a camp housing infected Nepalese peacekeepers. In a terse statement, Ban Ki-moon’s spokesman said damages claims for millions of dollars filed by lawyers for cholera victims was “not receivable” under the 1947 convention that grants the UN immunity for its actions. But a lawyer for the cholera victims said that UN immunity could not mean impunity, and said the case would now be pursued in a national court. The lawyer, Brian Concannon, said the victims’ legal team would challenge the UN’s right to immunity from Haitian courts, on the grounds that it had not established an alternative mechanism for dealing with accountability issues, as stipulated in its agreement with the government. Brian Concannon also said lifting immunity would not challenge UN policy, which is protected by the convention, but its practice, such as how to test troops for disease and properly dispose of sewage. In December the UN launched a $2 billion appeal to fight the cholera epidemic, which is currently the worst outbreak in the world, and Ban Ki-moon reiterated to Michel Martelly the UN’s commitment to the elimination of cholera in Haiti. Cholera is a disease of poverty, analysts say. It is spread through infected faeces and, once it enters the water supply, it is difficult to stop – especially in a country like Haiti which has almost no effective sewage disposal systems.